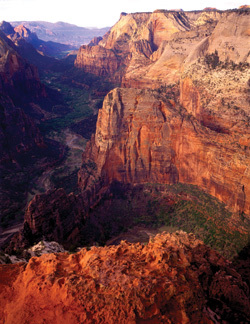 Photo courtesy of Utah Office of Tourism. The Jordan River runs through Salt Lake City, Utah’s mountain-ringed capital. Despite hot, dry summers, it is one of the greenest cities in America, its grid of streets lined with mature shade trees. At the heart of the grid, which is typical of Mormon-built cities, lies Temple Square. There stands the multispired Salt Lake Temple, oriented toward Jerusalem. Around the square new skyscrapers, signs of prosperity, thrust heavenward. According to the Book of Mormon—a sacred text of the Church of Jesus Christ of Latter-day Saints—Lehi, a prophet and a descendent of Joseph, led the tribe of Manasseh out of Jerusalem around 600 B.C.E. and sailed to the Western Hemisphere. Thus, the lost tribes of Israel became the early inhabitants of the Americas, and Utah the new Zion. Julius Gerson Brooks and his wife, Fanny, both from Silesia (then part of Prussia), were the first Jewish family to settle in Salt Lake City. They arrived in 1853 and opened a millinery store and a bakery. Solomon Nunes Carvalho, a Sefardic Jew from South Carolina who was a portrait artist and the first professional photographer to capture images of the West, arrived soon after to recuperate from a mapping expedition in the Rocky Mountains. In 1857, a new territorial governor arrived with troops to enforce federal law, settling 35 miles south of the city at Camp Floyd and attracting Jewish merchants. The first were Nicholas Siegfried Ransohoff and Samuel H. Auerbach. In 1864, Auerbach and his brother Fred opened a store on Salt Lake City’s Main Street that later became the F. Auerbach and Bro. department store. A former home of Congregation B’nai Israel. But Mormon leader Brigham Young accused non-Mormon businessmen of price gouging, bought seven of their businesses, including Ransohoff’s, opened the Zions Cooperative Mercantile Institution in 1868 and for two decades urged Mormons to patronize only its stores. Many Jewish merchants moved to Corinne, on Bear River, where they established the Liberal Party, the first opposition party. In October 1864, Yom Kippur services were held in a private home in Salt Lake City and, in 1865, at the Masonic Hall. In 1866, services were held in a hall on Temple Square provided by Brigham Young. The first reported circumcisions were in 1872. The Watters family hosted the first communal Seders. Meanwhile, Jews and non-Mormon Christians built Independence Hall, an adobe structure on Broadway near Main Street that both groups used for worship. 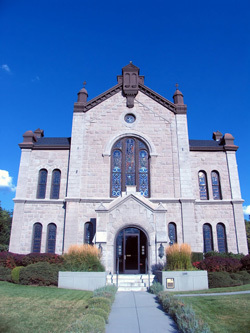 Utah’s first synagogue, Congregation B’nai Israel, was formed in 1881, and by 1883 it had a building that was both a Hebrew school and synagogue. This Orthodox congregation became polarized when Rabbi Leon Strauss introduced Reform services in 1884, and he had to leave. In 1889, Jews who originally came from Eastern Europe established Montefiore Synagogue; the congregation started building a house of worship in 1903. Shaarey Tzedek, an Orthodox congregation, existed from 1916 to 1940. From time to time there was a kosher butcher. Montefiore Synagogue. Photo by Esther Hecht. By 1915, there were two congregations, a B’nai Brith lodge and Jewish stores and businesses in a dozen Utah towns. There were also peddlers and dealers in scrap iron, junk, furs and hides. Nathan Rosenblatt, who began as a peddler, established Utah’s first steel mill and what became the Eimco mining equipment and services firm, one of the city’s largest employers. Other extant businesses founded by Jews are the Sweet Candy Company, Standard Optical and Allied Metals. Simon Bamberger went into silver mining and then coal mining and built a new railroad from Salt Lake City to Ogden, which brought travelers to his Lagoon resort in Farmington (now an amusement park). He was elected governor in 1916, promising a liberal and progressive administration. In 1932, Louis Marcus became the city’s first Jewish mayor, serving until his death in 1936. The Salt Lake City Hadassah chapter was formed on February 24, 1943, the 31st birthday of National Hadassah. As the University of Utah developed, it attracted more Jewish students and academics, especially to its medical and law schools. Local Jewish men enlisted in both world wars. After World War II, the city’s local Zionists approached Mormon leader George Albert Smith to get Mormon backing to support the establishment of Israel. Jews—especially young families—have been moving to Utah in increasing numbers since 2002, when the capital showed off its attractions as host of the Winter Olympics. Many are professionals, drawn by work opportunities and the sporty, friendly lifestyle, but their children tend to leave for college and not return. The community is very active in civic and Jewish affairs and is also physically active. The Ark in Kol Ami. Photo by Esther Hecht. The state’s Jews, estimated at between 3,000 and 6,000, are clustered mostly in Salt Lake City, Park City and Ogden. They include several dozen families from the former Soviet Union and about 50 Israelis. They tend to be more liberal than the surrounding culture, and lines between Jewish denominations are unusually fluid. Adults and community leaders report excellent relations with their Mormon neighbors and agree that living among a majority with a strong religious identity (nearly half the city’s population is LDS) has helped build a strong Jewish identity and community. Nevertheless, they report that Mormon classmates have tried to proselytize their children. Many send their children to private schools. Salt Lake City has a large Reform/Conservative congregation, a Reconstructionist havura, a Chabad center and a Jewish community center. The United Jewish Federation (www.shalomutah.org) provides educational scholarships and supports Hillel for Utah at Westminster—which reaches out to Jewish students at the University of Westminster and the University of Utah (hillel@westminstercollege.edu)—as well as other agencies. The McGillis School is a secular school informed by Jewish values and culture. Its 325 pupils (about 20 percent of them Jewish), in grades K to 8, celebrate Shabbat, and Hebrew is one of the foreign languages taught (668 South 1300 East; 801-583-0094; www.mcgillisschool.org). For much of the 19th and 20th centuries, Jewish merchants had shops on Main Street and on neighboring State Street. The area and its Jewish historical sites can be explored on foot. The first home of Congregation B’nai Israel stood where the red-brick Peery Hotel now stands (110 West Broadway near West Temple), as a plaque on the hotel indicates. Continue two blocks east on Broadway to the corner of State Street to see the three-story Brooks Arcade with arched windows (268 South State), built in 1890-91 in Richardsonian Romanesque style by the early settler Julius Brooks. The upscale F. Auerbach & Bro. department store was across the street, roughly where a multibusiness office building now stands. Continue another three blocks east on Broadway and turn left on 400 East to see the gray sandstone-and-brick Romanesque Revival building with a large dark-gray dome (249 South 400 East). Also built in 1890-91, this was B’nai Israel’s second location, until the 1970s. The design, by German architect Philip Meyer, a nephew of Fred Auerbach, is said to have been based on Berlin’s Fasanenstrasse Synagogue. Today, the building houses the Henriksen/Butler Design Group. Return to Broadway, turn right, walk one block and turn left. The red-brick building with Moorish-style arches in the twin towers topped by onion domes was built in 1903 as Congregation Montefiore Synagogue, as indicated by the Hebrew letters in relief near the top of the gabled roof. 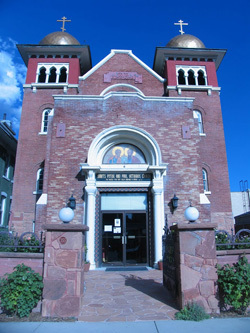 It now houses The Saints Peter and Paul Orthodox Church (355 South 300 East). Main Street. Photo by Esther Hecht. Continue to the corner and turn right, then walk one block. The five-story, wedge-shaped main library, designed by celebrated Israeli-born architect Moshe Safdie and opened in 2003, is suffused with natural light. A dramatic, crescent-shaped wall wraps the library, and the roof and glass “lens” on the southern façade look out on the city and the Wasatch Mountains. The Urban Room—a glass-enclosed atrium lined with shops—and Library Square are paved with Israeli limestone (210 East 400 South; 801-524-8200; www.slcpl.org). Return to the Peery Hotel. Just past it is the Rose Wagner Performing Arts Center, which has three theaters, permanent art installations and a rotating art gallery (138 West 300 South; www.slccfa.org). It is named for the mother of the donor, Izzie Wagner, and was built on the site of the adobe house where he was born. Return to West Temple and proceed three blocks north, turning left on South Temple to see Abravanel Hall, named for Utah Symphony’s legendary Jewish conductor, Maurice Abravanel, who achieved the highest per-capita symphony attendance of any state. The Modernist building of concrete, brick and glass seats more than 2,800. Its four-story lobby contains a red blown-glass sculpture, The Olympic Tower, by Dale Chihuly. Return to West Temple and walk north one block to visit the LDS Family History Library (35 North West Temple Street; 801-240-1794; www.familysearch.org), the world’s largest genealogical library, where researchers assist and teach visitors at no charge. In 2010, the church stated that new computer systems would help prevent submission of names of Jewish Holocaust victims and survivors for proxy baptism, a practice Jews had criticized. Southeast of downtown is Kol Ami (2425 Heritage Way or 2760 South; 801-484-1501; www.conkolami.org), the city’s main congregation, with both Reform and Conservative members. Its modern building is faced with brick inside and out. The arched, stained-glass ner tamid evokes a rising sun, and the Ark is ornamented with tablets of the law resting against a tree of life. According to Rabbi Ilana Schwartzman, Friday night services are generally Reform, and Saturday morning services are generally Conservative. An egalitarian minyan meets on Sunday, Monday and Thursday. The congregation has some 300 families, a religious school with 185 children and a mikve, and it emphasizes Hebrew proficiency. B’yachad, a Reconstructionist havura that split off from Kol Ami but is housed in the synagogue, has 25 to 30 very active households; many members are in their fifties. They lead services in Kol Ami’s chapel once a month. A Reconstructionist rabbi leads High Holiday services. Southwest of downtown is the Chabad center, run by Rabbi Benny Zippel. It has a daily minyan and Friday night and Saturday morning services, a mikve and a Talmud Torah Hebrew school for children 4 to 12 (1760 South 1100 East; 801-467-7777; www.jewishutah.com). The IJ and Jeanné Wagner Jewish Community Center (2 North Medical Drive; 801-581-0098; www.slcjcc.org), northeast of downtown, was once the Fort Douglas Country Club, which did not accept Jews. That prompted Izzie Wagner to buy it and open it to all. Twenty percent of families are Jewish. The older building is joined to the new by a lobby with a Star of David skylight. The center has a preschool and a Shabbat market on Friday mornings where halla, pastries and tchotchkes are sold. 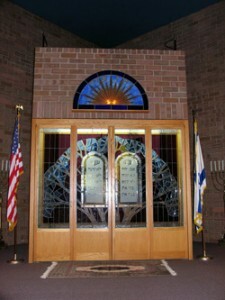 It houses the Jewish federation and the Utah Jewish Genealogical Society (www.ujgs.org). 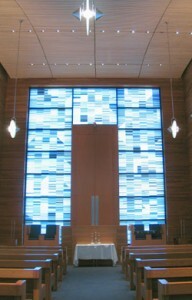 The center’s Holocaust memorial has two components: An indoor exhibition gallery houses vertical panels that outline the events of the Shoah, and the floor is made up of broken glass to recall Kristallnacht; outside, in a garden, is an installation of steel, wood, concrete and glass that is meant to evoke the rending of Jewish life. Temple Har Shalom, Park City. Simon Bamberger, Maurice Abravanel and Louis Marcus are among the notable Jews buried in the B’nai Israel cemetery (Q Street and 4th Avenue), one of two older cemeteries on land given by Brigham Young; the other is Montefiore (R Street and 4th Avenue). Shaare Zedek cemetery, at the top of the hill and across the road (1760 South 1100 East), was originally Orthodox but now serves all Jews. North America’s only ski-in, ski-out Shabbat service is one of the many attractions of Park City, 33 miles southeast of Salt Lake City. Home to the Sundance Film Festival, held each January, Park City has a historic town center, most of it dating to 1898. Rabbi Josh Aaronson calls Temple Har Shalom (3700 North Brookside Court; 435-649-2276; www.templeharshalom.com) mainstream Reform, open and growing. 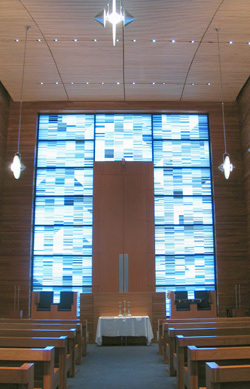 Since 2008, the 300 families have worshiped in a modern wood-and-glass synagogue that doubles as a major Sundance venue. On Main Street, visit Miner’s Plaza and see the Eimco Rocker Shovel Loader, Model 12B: It was developed and manufactured by a company founded by Nathan Rosenblatt and did away with the backbreaking labor of removing rubble from mine tunnels—1,200 miles of which lie under Park City. Java Cow Coffee and Ice Cream (402 Main Street; 435-647-7711) is Jewish-owned, sells halla on Fridays and has funky Western decor. Another restaurant, Bistro at Canyons, offers glatt kosher meals at Silverado Lodge (4000 Canyons Resort Drive; 855-444- KOSHER; kosher@thecanyons.com). Ogden, 40 miles north of Salt Lake City International Airport, boasts Utah’s oldest continuously operating congregation, Brith Sholem, which is affiliated with the Reform movement but uses Conservative prayer books on the holidays. The synagogue is in a small brick building, and its 50 households celebrate holidays, including Seders, communally (2750 Grant Avenue; 801-392-7688; www.brithsholem.org). Two Hebrew gravestones, tended by a Mormon farmer, are almost all that remain of Clarion, a Jewish cooperative farm near Gunnison, 135 miles south of Salt Lake City. Established in 1911 by Yiddish-speaking Jews from the Northeast, it was part of the international “back-to-the-soil” movement, aimed at breaking stereotypes and creating a new Jew. Clarion had about 150 residents at its peak. But poor soil, an undependable water supply and natural disasters led to crop failures, and most of the residents left in 1915. Two of them were successful: Benjamin Brown, who founded the Utah Poultry Cooperative Association, and Maurice Warshaw, who founded the Grand Central and Warshaw market chains. The settlers’ descendents gathered in 2011 to mark the 100th anniversary of the settlement’s founding. Actor and comedian Roseanne Barr was born in Salt Lake City. Because of anti-Semitism, her mother kept their Jewishness secret and the family attended a Mormon temple. Barr found her first public stage as a lecturer on her Jewish faith to Mormon congregations. Florence Prag Kahn (1866-1948), who in 1925 became the first Jewish woman to serve in the United States Congress (representing California), was born in Salt Lake City. Her parents were friends of Brigham Young. Kahn, a Hadassah member, was the first woman on the House Military Affairs Committee and the House Appropriations Committee. Eileen Hallet Stone’s A Homeland In The West: Utah Jews Remember (University of Utah Press) includes oral histories and conversations with pioneers. Sam Aaron (1866-1940), the son of a frontiersman, was the first Jewish boy born in Salt Lake City. An Arizona Pioneer: Memoirs of Sam Aaron (American Jewish Archives) highlights pioneer life, Apache raids and some of the interesting characters he met, including Wyatt Earp and his brothers. Utah is blessed with six national parks, including Zion and Bryce Canyon—two of the most spectacular and popular in the country. 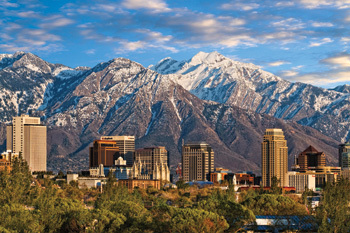 The Salt Lake City area offers skiing, hiking, biking, water rafting and other sports. Late spring and early fall are ideal, and the city’s flat terrain makes for easy walking and biking. The light rail’s free fare zone downtown includes the library, Main Street, Temple Square and other sights (www.rideuta.com). 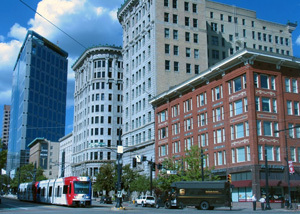 The Comfort Inn Downtown (171 West 500 South; 801-325-5300; www.comfortinn.com) offers comfortable rooms and friendly service within walking distance of many sights. Homestead Studio Suites (1220 East 2100 South; 801-474-0771; www.homesteadhotels.com) is a 25-minute walk from the Chabad center. Kosher on the Go, Utah’s only kosher deli and takeout, sells halla and light meals and provides hot meals on 24-hours’ notice (supervised by Chabad Lubavitch of Utah; 1575 South 1100 East; 801-463-1786; www.kosheronthegoutah.com). Congregation Kol Ami has a kosher coop for ordering kosher foods. Kosher groceries are available at Smith’s Marketplace (3300 East and 3300 South; 801-486-7514) and Albertson’s (1638 South 900 East; 801-484-8741). Wow, never thought that Salt Lake City having so much to see. I’ll gonna be there in a week, so I’m probably need to see all of this places. There is a historic site placard on one of the buildings of the Peery Hotel which indicates that it was the first site of Congregation B’nai Israel. It was said to have made of wooden construction and burned down in a fire.